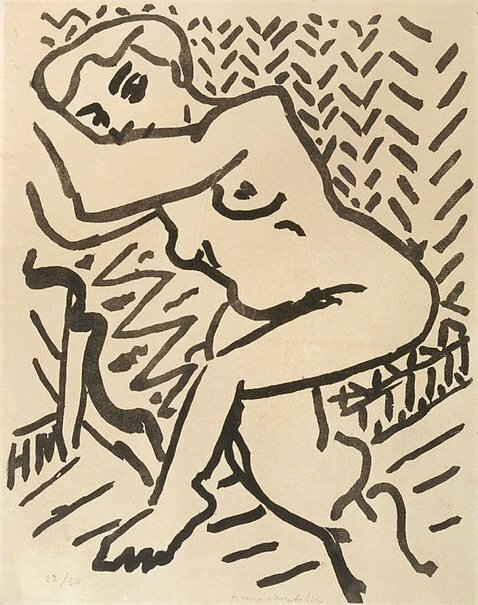 At one time Matisse was regarded as being as radical as Picasso. During the period in which he made this and other memorable prints, he was the acknowledged, if reluctant, leader of the fauvist movement. Rather than an organised school, fauvism represented a propensity in art that took late impressionist and post-impressionist pictoriality towards something rawer and more expressive. Historically, fauvism is a bridge to expressionism. Brutal reductions of form as much as brilliance of colour characterised the style. This black-on-white woodcut is thus a wholly fauvist work. Despite the simplicity of the composition, Matisse convinces the viewer of two things: first, that this is a record of a real and fully-rounded human presence studied from life; and, conversely, that it is no more than a terse and primitivistic arrangement of lines deployed across a surface. The tension between these extremes, and the fact of their simultaneous functioning, contributes to the almost fetishistic status of the work. Signed l.l. image, [incised block] "HM" and l.c. sheet, pencil "Henri - Matisse...". Not dated. Nicolas Draffin, Art Gallery of New South Wales handbook , 'Prints & Drawings', pp 109–24., Sydney, 1988, 120, illus p 120. Henri Matisse, catalogue raisonne de l'oeuvre grave , 1983, Vol 1, p 248, no 318, illus p 249. Bruce James, Art Gallery of New South Wales handbook , 'Western Collection: Works on Paper', pp 78–92, Sydney, 1999, p 87, illus p 87. Paths to abstraction 1867-1917 , Sydney, 2010, illus p 153. Judith Wright, Look , 'Building the Collection', pp 6, Melbourne, Apr 1999, p 6, illus p 6.